Back in 2004, when the GMR Group was given the task of developing the Delhi airport, retailers did not seem too enthused about the prospect of setting up shops in the airport premises and they had to be much coaxed and incentivised. But things have now changed drastically. Travel retail is no longer a nascent and unexplored territory in the Indian market. More and more brands are turning towards airports as an opportune location to engage their customers. Even with higher rentals, brands are keen to be present at airports because they have access to a highly segmented audience. Airports allow stores to experiment with different formats, which pose as an attractive diversion to passengers who have ample time to kill. A report from Knight Frank highlighted that as per early-2015 estimates, retail stores in the Indira Gandhi International Airport at Delhi, which is also the busiest airport in the country, were responsible for almost 62% of its total non-aeronautical revenue of the airport, with a compounded annual growth rate (CAGR) of 33%. Bangalore international airport was the first airport in the country to offer seamless retailing along with the flow of passengers. There are more than 100 Indian and international premium brands currently operating at the airport, across various categories. From the elderly traveller to the teenaged vacationer, from the passionate sportsman to the keen businesswoman, people across all demographics can find something to interest them from our retail spread. Mumbai's Chhatrapati Shivaji International Airport has around 21,000 sq m area in its swanky T2 terminal dedicated to retail as per the study. Mumbai’s T2 has been a launch platform for the debut of some of the best-in-class brands in travel retail. More than 30 brands, of the likes of Adidas, Lacoste, Fossil, Delsey, Burger King, MAC, Clinique, and others have made their foray into domestic travel retail at the Mumbai International Airport. A few prominent brands include Rado, Longines, Forest Essentials, Superdry, Porsche Design, Samsonite, Black Label etc. These stores offer a wide variety of products ranging from jewellery to clothing, footwear to electronics, sportswear to cosmetics, and designer leather goods to luggage in all possible sizes. Innovative retail concepts at airports.. Automobile stores like DC and Porsche Design offer passengers a glimpse of customized, luxury cars, making for first-hand interaction, much like mall displays. Pepperfry allows customers the unique opportunity to experience their products at the studio, engaging them to a level far greater than possible for the brand elsewhere. “For passengers looking for something exciting to do at the airport, the Flight for Fantasy simulator allows one to pilot a flight to any of more than 20,000 Airports around the world. The duty free segment at T2 hosts the only Johnnie Walker outlet at an Indian airport, and only the fourth in the world. Through these unique outlets, we strive to provide an exceptional experience to transiting passengers,” said the spokesperson from Mumbai International Airport. According to Verdict Retail’s Airport Retail Survey and Luxury Trends 2015-2016, precious jewellery, briefcases, men’s bags, and handbags are among the most likely items to be purchased at airport stores. Leading designer clothing and footwear brands, especially those of a foreign origin, are fast becoming most preferred by travellers. There is also a gradual shift towards fragrances, cosmetics and luxury watches. As per Knight Frank report, generally, on an average, per square feet rental values at airports are nearly double of what retailers pay at high streets, although revenue sharing arrangement between the airport operators and the brands is also prevalent in some cases. 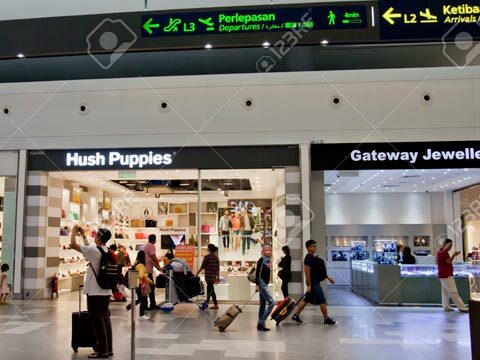 Another area of concern entails that there is always a possibility for private airports to inadvertently go overboard with their retail plans, thus converting their terminals into mega malls. Airports must strike a balance between retail space and passenger facilities. Terminal 2 at the Mumbai airport, which sees a footfall of more than 40 million passengers in a year, has turned itself in to a ‘mall along the runway’ with the establishment of a wide range of national and international brands in its retail area. From high-end brands to sought-after restaurant chains, the airport has tried to lay out a variety of desirable features and services for its travellers, effectively transforming itself into an unabridged shopping and leisure destination. The Centre for Asia-Pacific Aviation (CAPA) estimates that the duty-free spend at Indian airports will reach $1.6 billion by 2021 - an eight-fold increase, spread across a decade. The collective spend on duty-free, duty-paid and food and beverage is expected totouch $3.5 billion by then. Airport retailing is a popular concept globally but is still in its infancy in India. The non-aeronautical revenue, predominantly from retail, is more than double the aeronautical revenue at most airports abroad. The retail segment at airports has witnessed a high yearly growth. Brands have recognized this as a great opportunity to create a unique touch and feel experience at the airport. The Mumbai International Airport offers one of the best travel retail infrastructures in the country today and design briefs are given accordingly to all brands. The brands themselves have innovative designs to create optimum creative and commercial results.